Welcome to handsfreemichigan.com, a web page created by the Transportation Improvement Association (TIA) on September 24, 2016. The purpose of handsfreemichigan.com is to provide information regarding the hands-free movement that TIA is leading. Welcome to handsfreemichigan.com, a web page created by the Transportation Improvement Association (TIA) on September 24, 2016. The purpose of handsfreemichigan.com is to provide information regarding the hands-free movement TIA is leading in Michigan. 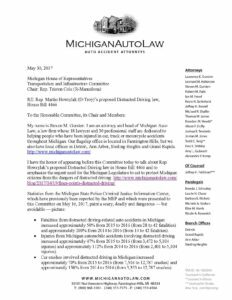 TIA recognizes that Michigan’s current texting law, MCL 257.602b, is too specific to texting and is extremely difficult to enforce. Since portable electronic devices now have numerous capabilities (i.e. social media, e-mail, video chat, a variety of apps, etc.) that drivers are engaging in, 16 states in the nation have a hands-free law. Those states clearly recognize a driver must keep their eyes on the road and hands on the wheel to safely operate a motor vehicle. MCL 257.602b also does not contain a penalty significant enough to deter distracted driving. Distracted driving is any activity that diverts attention from driving. Texting is the most alarming distraction. Sending or reading a text takes your eyes off the road for 5 seconds. At 55 mph, that’s like driving the length of an entire football field with your eyes closed. 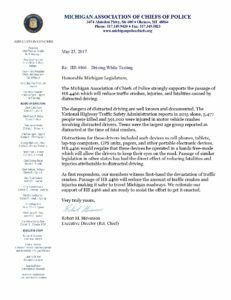 Preliminary numbers for 2018 indicate 75 persons were killed and 7,208 were injured in 18,922 motor vehicle crashes involving a distracted driver in the state of Michigan. In 2010, TIA provided support to the City of Troy on a hands-free ordinance. While speaking at a Troy City Council meeting, TIA mentioned the need for a statewide hands-free law. In 2011, TIA launched the award-winning “Remembering Ally: Distracted Driving Awareness Campaign” after TIA’s CEO, Jim Santilli, sadly attended the funeral of Ally Zimmerman. 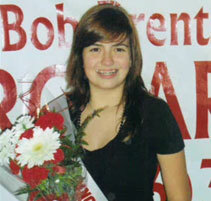 Ally was a 16-year-old Romeo High School student who was hit by a distracted driver while traveling as an innocent passenger on December 28, 2010. She was very involved in her school and community, and had dreams of changing the world. However, her dreams and life were ended by a distracted driver. Santilli and Ally’s mother, Laurel Zimmerman, immediately recognized that a hands-free Michigan is needed. However, there was no legislative support at the time since distracted driving was a relatively new topic. 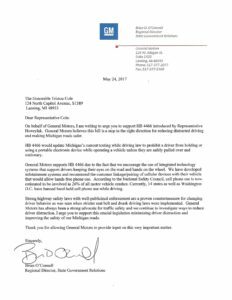 State Rep. Martin Howrylak (R-Troy) and Jim Santilli, CEO of the Transportation Improvement Association reveal a hands-free bill for Michigan on September 6, 2016. 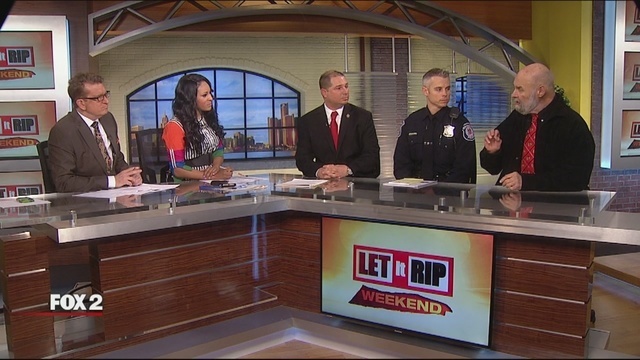 They were joined by Lt. Aaron Burgess of the Sterling Heights Police Department, and Chief Robert Shelide of the Shelby Township Police Department. 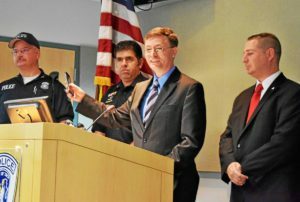 At a press conference held in southeast Michigan on March 30, 2016, Santilli announced TIA would be encouraging the Michigan Legislature to pass a hands-free law. Shortly after the press conference, Rep. Martin Howrylak (R-Troy) joined forces with TIA and stated he’d be willing to sponsor the bill. Santilli immediately began conducting research and communicated with officials in other hands-free states to identify successes and challenges. Once best practices were identified, Santilli wrote the language for the hands-free bill. Rep. Howrylak and Santilli announced HB 5867 at a press conference on September 6, 2016. Due to a limited legislative session, Rep. Howrylak re-introduced the bill. 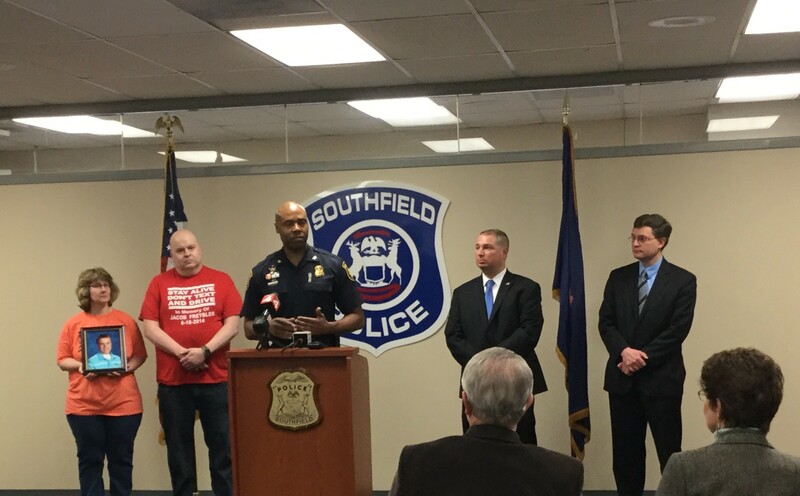 (left to right) Diane and Jim Freybler, parents of Jacob Freybler; Chief Eric Hawkins, Southfield Police Department; Jim Santilli, CEO of the Transportation Improvement Association; and State Rep. Martin Howrylak announce HB 4466 on March 31, 2017. 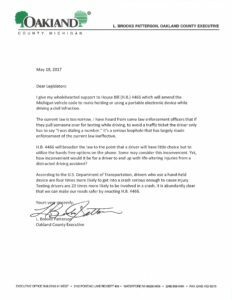 HB 4466 was announced at a press conference on March 31, 2017. Rep. Howrylak and Santilli were joined by the Freybler family who sadly lost their son, Jacob, to distracted driving. HB 4466 had the following co-sponsors: Reps. Jim Ellison (D-Royal Oak), David LaGrand (D-Grand Rapids), Frank Liberati (D-Allen Park), Peter Lucido (R-Shelby Township), and Michael Webber (R-Rochester Hills). Furthermore, HB 4466 had the support of Ford Motor Company, General Motors Company, the Michigan Association of Chiefs of Police, Oakland County Executive L. Brooks Patterson, and other entities. Laurel Zimmerman, the mother of Ally Zimmerman, testifies before the Transportation Committee on May 16, 2017. During the testimony, Laurel discussed the loss of her daughter and need for a hands-free Michigan. 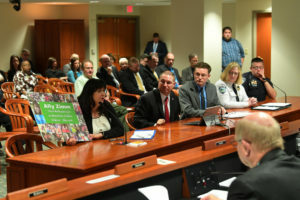 (left to right: Laurel Zimmerman, mother of Ally Zimmerman; Jim Santilli, CEO of the Transportation Improvement Association; State Rep. Martin Howrylak (R-Troy); Chief Doreen Olko, Auburn Hills Police Department). On May 16, 2017, Rep. Howrylak, Laurel Zimmerman, law enforcement leaders, and Santilli testified before the House Committee on Transportation and Infrastructure. During TIA’s testimony, Santilli gave an overview of the language and reasoning behind it. 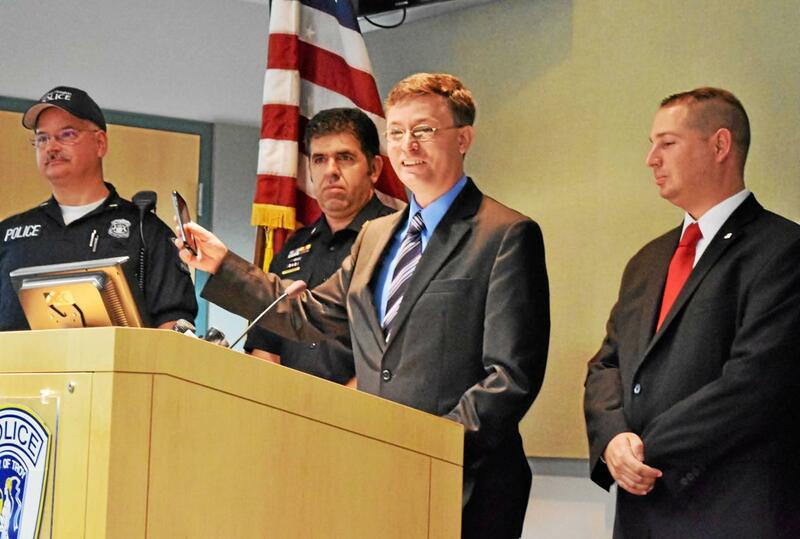 He also emphasized that California enacted a ban on hand-held cell phone use in July of 2008. Based on traffic crash records two years before and two years after the hand-held ban went into effect, overall traffic deaths declined 22% and hand-held cell phone driver deaths went down 47%. Another hearing was scheduled on May 30, 2017. However, Rep. Howrylak and Santilli were unable to speak due to a Committee time constraint. Unfortunately, and despite numerous follow-up messages, the Chairman of the Committee (Rep. Triston Cole, R-Mancelona) and Committee failed to act. Since the first hands-free bill was announced on September 6, 2016, 162 people were killed and 17,410 injured in Michigan due to distracted driving (Note: End period used was December 31, 2018). Overall, it is imperative drivers keep their eyes on the road and hands on the wheel when operating a motor vehicle. TIA is confident a hands-free law will achieve this goal, and give law enforcement the ability to keep our roadways safe.